We are now open at our new shop in Petworth, the shop is opposite Saint Mary's Church, at the top of the picturesque cobbled Lombard Street. The shop is spacious with good large windows and it is an exciting prospect to be able to arrange it with our Decorative, Interesting and Eclectic Antique Furniture and Objects. The shop is open at present from 10.30am until 5.30pm Tuesday to Saturday. At other times, please call 07970 683949, we are happy to meet you there if we are nearby. 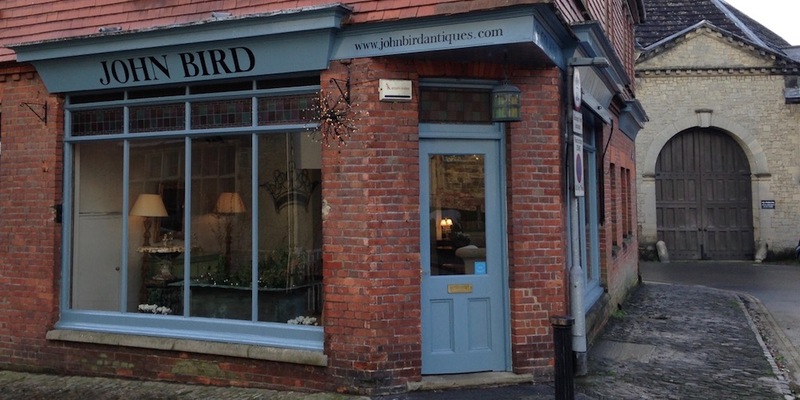 At John Bird Antiques in Petworth we offer a wide range of decorative and formal antiques plus unusual objects and antique lighting. So whether you are interested in finding an antique occasional table or a stylish upholstered chair or any other piece of antique furniture or decorative items and works of art, we can usually help. John Bird is a well established and well respected antiques expert who has frequently acted as a furniture vetter on various antique fair vetting committees including the Battersea Decorative Antique and Textile Fair and the Olympia International Art and Antiques Fair.